There is sad news for EVIL DEAD fans as we have learned that Starz has officially canceled the Horror/comedy series ASH VS EVIL DEAD after having three seasons. “Ash Vs Evil Dead has been the ride of a lifetime. 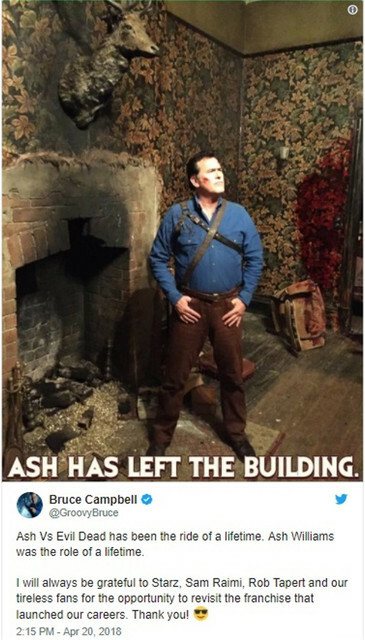 Ash Williams was the role of a lifetime. The third season stars Bruce Campbell, Ray Santiago, Dana DeLorenzo, Lucy Lawless and Arielle Carver-O'Neill. Campbell executive produces the series with Sam Raimi, Rob Tapert, Ivan Raimi, and Rick Jacobson. ASH VS EVIL DEAD is currently airing on Starz.